POW in Russia, page 3. THE DUTIFUL AND THE DAMNED: STALIN AND HIS MURDERS, Lena Stuyrcevich. Teacher from the Ukraine. 1929 sent to Solovki. 1930 shot. Solovki basics. "Most of the gulag buildings have gone (Likhachev went back in 1966 and already they had disappeared) but there's still the trapeznaya, the dining hall which, he says, was crammed with not hundreds but thousands of prisoners sleeping on the floor, in lice-ridden filth, with no heating. Now it's empty, whitewashed; the cool lines of a vaulted ceiling have a defiant elegance. "Finally we get to where I want to be: the gulag museum; it's housed near a monk's dormitory and the laundry. There are hundreds of photographs of inmates with the barest of information: name, profession and date of death (almost always "shot"). Now and then a relation has placed a flower beneath the photograph. "It was Lenin who turned Solovki into a prison camp in 1922 for "undesirables" - political opponents such as mensheviks and socialist revolutionaries, as well as Jews, gipsies and ethnic minorities. "But it was Stalin who gave Solovki the status of gulag, filling it with kulaks, peasants and the intelligentsia of post-revolutionary Russia. The brightest and the best were sent to Solovki - scientists, engineers, teachers, writers, painters and poets. All summer typhus raged in the mosquito-infested swamps where the prisoners cut logs and peat; all winter, when the sea froze solid, half-starving men and women battled against blizzards in temperatures of -50c. "'Strashna [ghastly],' Galia murmurs periodically as we look at photographs of the victims; below the alert sensitive faces their fate is typewritten: Lena Stuyrcevich. Teacher from the Ukraine. 1929 sent to Solovki. 1930 shot. "I couldn't help noticing the photographs of Likhachev's camp commander, the proud Degtyarev who rode about on a white horse and was followed everywhere by a dog called Black that sniffed out runaways and barked enthusiastically when the executions started. In the 1930s it was Degtyarev's turn to be arrested and shot. MOSCOW, August 5. A commemorative festival entitled Days of the Politically Repressed will be held on the Solovetsky islands from August 6-9, marking the 80th anniversary since the labour camps were opened here. As a Rosbalt correspondent was informed by the press office of the Moscow administration today, the festival is being organised this year by the Solovetsky nature reserve, the Memorial centre of Saint Petersburg, the international Memorial organisation in Moscow and also the Moscow administration. The first labour camp was opened on the Solovetsky islands in 1923. A whole network of such camps were later set up by the NKVD, which Russian writer Alexander Solzhenitsyn later termed as the GULAG Achipelago. The idea to hold a commemorative festival to remember the victims of political repression arose in 1998 and several former prisoners and their relatives were invited to the event as well as leading human rights' activists, historians and journalists. More than 100 guests from Russia and Ukraine are expected to attend this year . They will visit the Solovetsky Kremlin and the Church of the Ascension which was used as an intimidating isolation cell during the days of Stalin. I found your website on displaced persons camps. 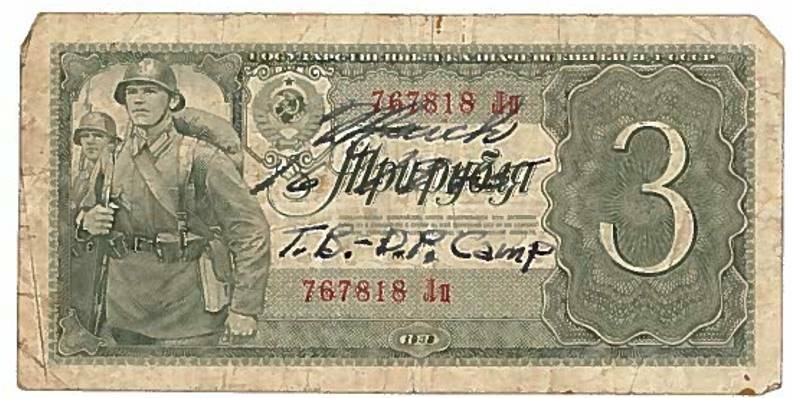 I have a Russian bill with T.B. – D.P. Camp written on it. I have not been able to determine what camp T.B. is or where it is (assume it was in Russia). I have firstly looked at sites ref Carpathian camps because, I could be wrong, the helmets and uniforms of the soldiers on the bill suggest that they are Romanian = as seen in photos of Romanian troops around Sevastopol & Stalingrad. (i) in the top right hand corner of the bill are, faintly discernible. the Cyrillic letters CCCP i.e. USSR.. I am tempted to think that the words across the top of the bill could, paraphraised, be Romanian Soviet Socialist Republic USSR? (ii) also visible but miniscule is a typical SSR - style republic flag /banner with, in the centre, a 5-pointed red star. As noted, I have run some broad sweep Carpathian region searches and will carry on with these. Meantime, there is one possible explanation for the letters..T.B...and that is..Tuberculosis. I ran some basic checks & the above appeared. Thinking on different levels...I have also noted the bill's bank / issuer number & will ask my spies to snoop around. Meantime, a cocktail of patience, perseverance and thinking outside the box is a potent tool. Here's to a successful end result. Vorkuta, Norilsk and Kolyma: Which camp was the worst? Gulag: A History of the Soviet Concentration Camps, by Anne Applebaum, is published by Allen Lane, $59.95. Probably the three worst camp complexes were the three built north of the Arctic circle: Vorkuta, Norilsk and Kolyma. The climate alone made life in these camps unbearable: the sun did not shine for six months of the year, winter lasted for 10 months, summer was made unpleasant by swarms of mosquitoes. Because of the climate, these camps also seemed to attract the harshest, and most corrupt, administrators, as well. Of the three, Kolyma was probably worst of all, simply because it was so far away from "civilisation". The camp complex was located in the far north-east of Siberia, in a region inaccessible except by boat from Vladivostok. To Muscovites and Leningraders, it seemed like another country. THROUGHOUT his tortuous 10 years of hard labour in Stalin's gulag, Pavel Negretov dreamt of the new life that would begin on the day he finished his sentence for anti-communist activities. Still a young man, he imagined himself starting afresh in Moscow, far from the horrors he had endured. That new life never came. More than half a century later, Negretov remains stranded in Vorkuta, in the Arctic Circle, where he was sent to work in barbaric conditions in the coalmines of Russia's far north. Now 75, he has yet to be granted the residence permit he needs to move with his wife to the Russian capital. Negretov is not alone. Hundreds of former opponents of Stalin's dictatorship, including 250 in Vorkuta, have been left to their hard lives in remote regions to which they were exiled in the 1930s and 1940s. Most have struggled ever since to return to their home towns and villages. Thousands have died of old age without being allowed to resettle. Deprived long ago of any opportunity to establish themselves, however, they are poor. If they moved without an official permit, they would have no legal right to work or to receive vital benefits, including healthcare. "I have been here 52 years, and I have dreamt all my life of living in a city like Moscow or St. Petersburg," said Negretov. "Our state has no conscience. It has forgotten about us and the Russian people as a whole. We have no democracy, only greed for more power. And who is Boris Yeltsin? A former Communist party boss. Power has not changed hands." Which time was the worst? The worst era, unquestionably, was the war era. In the winter of 1942-43, about a quarter of Gulag prisoners died. The cause, quite simply, was the total disruption of the economy and of transport systems, which led to genuine starvation. Whole camps received no supplies whatsoever for weeks on end.